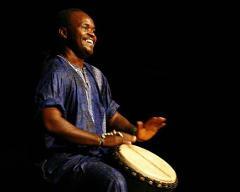 This invitation-only course is designed to extend drummers in the Canberra community who have either progressed through Drum Effect’s beginner and experienced classes or studied djembe/dundun to the same level elsewhere. If you are interested in joining the class for the first time and haven't yet been invited, please contact Kate to discuss. You are welcome to learn dundun (ballet or traditional style) during the class, noting that it is best if you can bring your own dundun. A dance class will follow immediately after the drumming class and you are encouraged to stay and drum for the dance whenever possible.